Brainjogging reinvented for kids! With great attention to detail this game addresses children and parents looking for family friendly gaming fun and a great learning experience. You will find the funny setting on the Isle of Brains an ideal environment with comical fruit taking the role of the brain trainers. 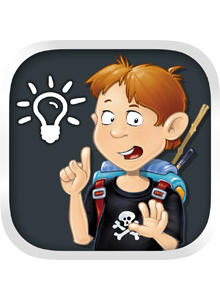 A collection of challenging games is waiting to be solved by clever kids. The instructions for each game are clearly written but they are also read out by professional voice actors, so that children less experienced in reading will have easy access to the rules and objectives of the games. All games come with friendly ambient background music and sounds and if there is progress and success the fruity trainers have encouraging comments all the time. A rich and creatively drawn gaming world and great fun games leave no room for getting bored. Each success is recorded. With four levels of difficulty players can choose what kind of challenge they want. Your choice from simple as a banana to lemon difficult will select just the right fruit to be your coach for a given game. The games encourage different skills from counting small sets of numbers, calculation, logical thinking, eye-hand coordination to the talent of organisation. If all that sounds too easy for you then try switiching the game to German and play a round of Lexikong! - you are five years or older. - you are keen to expand the minds of your children. - you are an adult nut nevertheless interested in funny puzzles to kill some time. - you want to train your comprehensive skills in an entertaining way. - you are looking for screaming action. - you want to shoot at things or blow them up.